Filters. What kind are there and how do they work. The world famous trickel filters at Momotaro. 1 and 2 are often combined in ready to use systems. A pre-filter is the first step to get (coarse) waste like koi poo, leaves and such out of the pond system as fast as possible. It is the first filtering step after the dirt is removed from the pond through the bottom drain. The pre-filter also ensures that the biological filter is not clogged with large debris which would have a negative influence on the operation of the biological filter. A popular pre-filter is a sieve, but drum filters are used more and more. Previously the job was done using chambers with brushes or large vortices. Brushes work fine but bring annoyance when cleaning, this is a dirty job. The vortex only works well when sufficient size, a minimum of 90 cm diameter is required. When its to small the current will be to fast and the dirt does not settle. This is usually the case with prefabric filters and these can be improved by adding bruches into the vortex. The major drawback of this system is that the dirt remains in the water. A modern variant of the brush chamber is in a layer of 20-30 cm thick bed static medium like K1. Let this sit without air floating on the water and it will sieve. For cleaning, the air can be connected to this "bed", after which the dirty water can be discharged to the sewer. Modern filter lines usually have a curved screen (sieve) or sieve drum as a prefilter. There are many types on sale. In general a screen has the advantage that dirt is collected dry and removed constantly (out of the water) so less ammonia remains in the system and ultimately less nitrate will. If there is written that a sieve will lower nitrate levels that's the reason. The disadvantage of the use of a sieve is that it will be directly connected to the bottom drain (gravity-system), but the rest of the filter line is then pump-fed, since the pump is always in or after the sieve. The rest of the filter line is thus higher than the pond in order to ensure a good flow. A sieve can filter particles of 200μm out and a drum filter is tipically 40µm but 10µm is possible (most parasites are much bigger and are thus filtered out of your pond to reduce the numbers). Drum filters are unfortunately very expensive but they can get the smallest dirt from water and are available fully automated. The dirt that is caught can be automatically discharged and is thus the fastest out of your pond system. A biological filter is the place where the dissolved toxic wastes ammonia and nitrite are transformed into the relatively harmless nitrate by bacteria. Everything can be used as a "home" for bacteria because bacteria attach anywhere. However, there is a lot of difference in the speed and number of bacteria that are able to attach to the different materials. And the math is simple, the larger the surface, the less space you need to get enough bacteria to adhere. The more bacteria, the more waste of your koi can be dealt with. Traditionally blue japanese mats are used, but there are several brands on the market that compete with the Japanese mat. Matala and red-x are examples. But also Kaldnes, usually used in a moving bed, bacteria house, KSB and siporax used in trickeltowers and beads in bead filters are widely used. Complete multichamber ready to go filtersystems are widely sold and are almost always to small. The vortex is to small and only one chamber filled with some matting is a biological stage. In practise after a few years hardly any are used that way. Most wil add a sieve as pre filter and use one or more chambers as a K1 kaldness moving bed, and in this way also the filtering ability of such a filter is greatly improved. Others sell their multichamber filter through and continue with 440l filter units behind a sieve. According to many, a trickel tower is the best biological filter possible but it has some drawbacks: you have a large hight difference so big pump, and noise, and cooling / heating of the water when this filter is outside. But if this is resolved or not a problem, momataro for instance prooves on his biggest pond that it can yield great results. 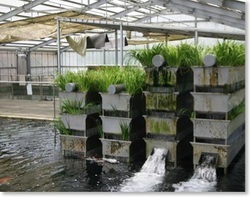 To get rid of ammonia in your koi pond a moving bed filter is the ideal choice. Not for nothing the professional fish farms use this filter principle. The advantages are that a small volume can process a large amount of food and waste. This is because the medium has an average surface area of ​​800m ² per m³, against Japanese mat of 350m ² per m³. A little rule of thumb is that 100 liters of medium can handle 700 grams of high quality food per day. The aeration of the filter medium allows for the movement and prevents dirt from attaching to the solid filter material. There is thus also a much larger surface area utilisable. Advantage is the price, the medium is cheaper to buy. There are different types of media on the market. The best known are Kaldnes, Bioflow and Beecell. As a solution for very fine suspended dirt a very easy solution became available. It's so simple, it's almost stupid that it took so long to discover. This type of filtering can also be used as a pre-filter. it is the same as the moving bed without aeration and it will capture all dust particles in the floating medium. As more dirt is trapped and remains the more dirt will stick. Almost all floating debris is caught in this way. Cleaning is a piece of cake, switch the pump off, turn on the air so it ecomes a moving bed and turn open your waste valve. The drawing below shows a setup that will work fine for almost all koi pond filters.